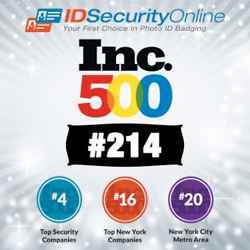 New York, NY � August 26, 2014 � IDSecurityOnline.com, a leading provider of ID card printers and photo ID systems, announced today that it ranked #214 on the 2014 Inc. 500 list, an exclusive list of America�s fastest-growing private companies. IDSecurityOnline.com has earned the #214 position on the 2014 Inc. 500 list thanks to an astonishing three-year sales growth of 2,093%. IDSecurityOnline.com has been named the 4th fastest growing security company in the United States. It also ranked #16 on the list of Top Companies in New York and #20 on the list of Top Companies in the New York City Metro Area. IDSecurityOnline.com provides photo ID badge systems, software, and supplies to organizations of all major industries including corporate, education, government, healthcare, retail and events. Thousands of companies nationwide rely on IDSecurityOnline.com to get durable, secure and affordable ID card solutions that will help them keep their employees, visitors and assets safe at all times. For more information, visit IDSecurityOnline.com�s company profile on the 2014 Inc. 500 list. IDSecurityOnline.com is a leading provider of ID solutions and answers the needs of all organizations and corporations such as government, Fortune 500 companies, schools/universities, hospitals, and international / local sporting events. IDSecurityOnline.com offers an extensive line of card printers, ID systems, supplies and accessories. These systems resist tampering with advanced features like holographic images, ghosted images, biometric data, smart card technology and enterprise level data base management. For more information, visit www.IDSecurityOnline.com. The Inc. 500|5000 is a list of the fastest-growing private companies in the nation. Started in 1982, this prestigious list of the nation's most successful private companies has become the hallmark of entrepreneurial success. The Inc. 5000 Conference & Awards Ceremony is an annual event that celebrates their remarkable achievements. The event also offers informative workshops, celebrated keynote speakers, and evening functions. For more information on Inc. and the Inc. 5000 Conference, visit www.inc.com.